A newly published Apple patent application sets out a way for a virtual SIM card to be built into an embedded secure element which can, in turn, be attached to an NFC controller chip. 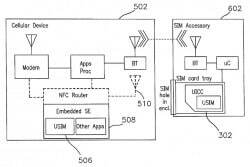 An NFC-related patent application filed by Apple in November 2010 has now been made public by the US Patent and Trademark Office. The “Wireless network authentication apparatus and methods” patent sets out a way to incorporate a subscriber identity module (SIM) into the body of a mobile phone, within an embedded secure element. 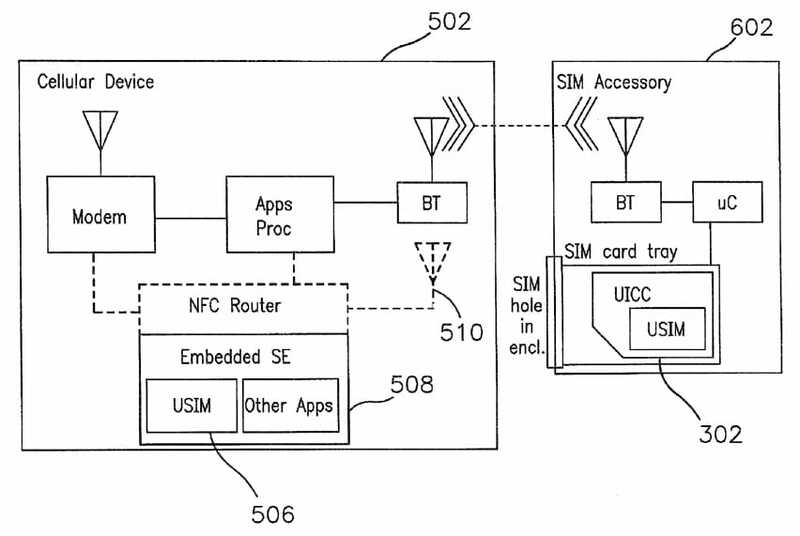 In one example, the patent shows the embedded secure element, with the ‘virtual’ SIM included within it, connected to an NFC controller and with space available within the secure element for both SIM functions and “other apps”. A design for a “SIM accessory” is also included. SIM WITHIN: Apple plans to put the SIM in the secure element, not the secure element in the SIM. A Bluetooth accessory could also provide a bridge to an external SIM. Click to enlarge. The Apple concept is similar in nature to the NFC SIMs issued by mobile network operators bringing NFC to market — except it is in reverse. In an NFC SIM, the NFC secure element sits inside the SIM, putting the carrier in overall control of a phone’s NFC functionality. In Apple’s concept, the SIM sits inside the embedded secure element, putting the iPhone maker in overall control of the unit and bringing in a trusted service manager (TSM) to provision customer credentials onto the unit on carriers’ behalf. Last October, rumours were widely circulated that suggested Apple was working with SIM and NFC specialist Gemalto on a virtual SIM concept, prompting speculation that Apple was aiming to cut carriers out of direct relationships with iPhone users. This new patent could enable Apple to do that, but also offers new NFC-related opportunities as well. Conventionally, user equipment is provided with a Subscriber Identity Module (SIM) card. The SIM card includes security information such as private key information that can be used in authenticating user equipment to a cellular network. It may not always be desirable to require the use of SIM cards. For example, the need to include a SIM card slot in user devices tends to make the devices bulky and add cost. It also necessitates management of SIM card inventories and distribution by the manufacturer or service provider. A user might also want to purchase wireless services even when the user is not able to easily obtain a SIM card. It would therefore be desirable to be able to provide improved ways in which to provide users with the ability to purchase and use wireless network services. In one aspect of the invention, a network service provider such as a cellular telephone company may distribute access client (e.g., Universal Subscriber Identity Module (USIM)) credentials to a trusted services manager via a USIM vendor or directly. The trusted services manager may maintain a list of authorized users. These users may be, for example, customers of the trusted services manager or an associated entity. User credentials may be maintained by the trusted services manager for each of the authorized users. A user at user equipment may authenticate to the trusted services manager using a set of user credentials. Once authenticated, the trusted services manager may provide the user with a set of USIM credentials. The USIM credentials may be stored in a secure element on the user equipment. When the user desires to use wireless network services, the user equipment may establish a wireless link between the user equipment and the network service provider. During authentication operations, the user equipment may use the USIM credentials that are stored in the secure element on the user equipment to authenticate to the network service provider. Following successful authentication, the network service provider may provide the user equipment with wireless services (e.g., cell phone voice and data connectivity). The ‘iPay, iBuy and iCoupons‘ patents, describing a comprehensive mobile payments, mobile commerce and mobile marketing business based around an NFC-enabled iPhone. Products+, an NFC-based product marketing and promotions application. An airline ticketing and boarding pass application that describes an unmanned, automated airport ticketing and baggage counter kiosk and introduces the concept of an automated security checking process where users of the iTravel app could process themselves through the security clearance system and check themselves in at the boarding gate. The Grab & Go patent, designed to make it easy for customers to transfer files between devices such as the Mac, iPhone and Apple TV. An NFC-enabled iPod, games controller, TV and iPhone. An NFC-based concert, entertainment and sports venue ticketing application that includes exclusive bonus features for users of Apple’s service. A design patent for an e-wallet icon. A patent covering the addition of an NFC antenna to electronic devices such as computer monitors where standard methods of integrating NFC may cause problems generating a sufficiently robust signal strength. Apple was once expected to be the first to adopt NFC but is now the only major handset maker to not have announced support for NFC. This week, however, it has made its first move into mobile payments in stores. The new Easypay service allows Apple Store customers to scan barcodes on items and pay from their iPhone using the credit card linked to their iTunes account.